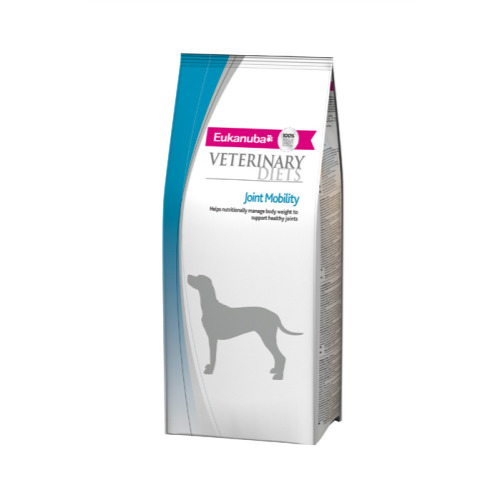 Eukanuba Veterinary Diet Joint Mobility Dog is formulated to help delay aging progression of such joint issues. Nutrition is one vital component of that regimen. This formula has glucosamine and chondroitin sulphate, to provide the building blocks for healthy cartilage; L-Carnitine to help your dog metabolize fat; and micro-crystals to help reduce tartar buildup across the whole mouth during and after meals. Recommended For: Joint and mobility issues. It is recommended that a veterinarian's opinion be sought before and during the use of this product in order to determine the needs of your dog. Joint/Mobility Issues - Osteoarthritis, Orthopaedic Procedures, Joint Trauma. There are currently no questions for Eukanuba Veterinary Diets Joint Mobility Dog Food - be the first to ask one!